In light of the recent weeks’ announcements, I’ve been on another (even more intense) downsizing mission. I was getting rid of a few dresses the other day and decided to snap some pictures to show you what I have in my closet, and how I go about deciding to get rid of something. I had a lovely influx of clothing from my friend Madeline at an informal clothing swap, but soon realized that I needed to get rid of some dresses to make way for any incoming ones. (Luckily, she and some of my friends took some lingering random craft supplies off my hands as well). 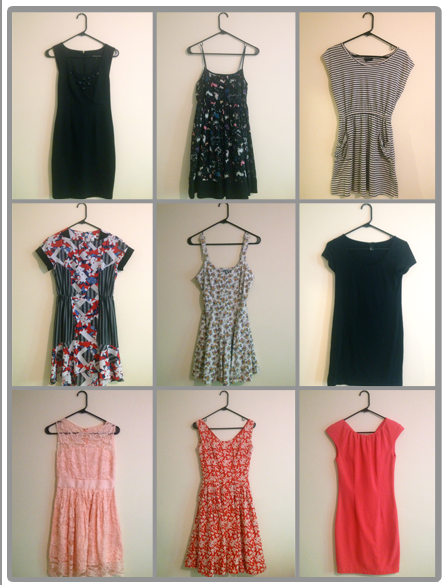 I didn’t downsize much – just from 12 dresses to 9, but I figure since I’ll be living in Los Angeles soon, I’ll want to have a nice handful of dresses that I love to wear in weather that I’m about to totally love. While I don’t have an exact count, based on my previously packed closets, I’m going to guess that I used to own over two dozen dresses. I wore dresses less then than I do now, so there was really no need for that many. Let’s take a look at where I’m at now. The Little Black Dress: Oh this dress is so lovely. I wanted one badly, found my size at Express, and took to EBay to see if there were any available. The photo doesn’t even do this beauty justice – I snagged it for $15 and wear it for most formal events I attend (which, let’s be honest, are few and far between). The Rabbit Dress: My go-to dress for anything fun, ever. I love the little rabbit print on it, and feel so much myself when I’m wearing it. Funky, fun, and a little bit ridiculous. This one’s a keeper. The Stripe Dress: Like my little black casual dress, I could wear this dress every day. It’s slouchy, sleeved, and it has pockets. I’ve considered buying a bunch of fabric and recreating this Kohl’s find hundredfold and, wearing nothing else but replicas of it. The Casual Black Dress: Okay, so I do have two black dresses. But this one is like wearing a giant, stylish t-shirt that you can dress up or dress down. I’ve been waiting for them to go on sale at H&M (because a price tag of $12.95 is too much, right?) because I’d wear nothing but this dress or the stripe dress if I could. Only one outfit like a cartoon character = awesome. The Patriotic Dress: I try not to think too hard about this dress being red, white and blue. With the patterns and the black, though, it really can be used for more than just a Fourth of July picnic. Also, it’s one of those mullet dresses that’s longer in the back and shorter in the front. By all accounts, I shouldn’t even like this dress, but I do. The way it fits, the modest sleeves and the perfectly positioned waist, and the funkiness of the pattern really get me. I’m keeping this because it reminds me to be a bit daring with what I wear. The Jumper: Is there an age limit for these things? Regardless, This one fits like a dream and the floral pattern is so sweet. No one ever knows that it’s not a dress, so I love the sneaky factor too. Keeping it until someone says that I really shouldn’t be wearing it….and even then, I’ll probably keep wearing it. The Other Patriotic and Stripe Dress: I just got this from my friend Madeline, but I looked and saw that I have other dresses that cover the bases that this one does. Since it’s entirely see-through and I don’t own a proper slip, this one’s going. The Bridesmaid’s Dress: It’s pink, lacy, delicate and I wore it for my best friend’s wedding a few months ago. Another one that can be dressed up or down to fit the occasion. So is it beautiful? Yes. Useful? Yes. Does it mean something to me? Yep. It stays. The Sassy Black Dress: This one is a bit less formal than the other little black dress I have, but would be so perfect for a New Year’s-type party. It’s a little big on me, though, and I already have black dresses that serve the same purpose as this one. Sending it away! The Vintage Dress: My mom found this at an antique store and it fits me so perfectly. Since this feels very one-of-a-kind, I want to keep it for a while longer. Could be an Etsy product someday, but for now it’s my favorite summertime getup. And again, pockets. The Bright Dress: Again, another dress that I absolutely love (see a pattern here? Through all of my downsizing, I’m getting into the territory of really owning only things I feel strongly about) I’ve worn this for interviews, dinner dates, weddings and even just as casual officewear. Heels and something shiny make it fancy, sandals and a belt (I think I have three belts?) make it casual. The Dress That Looks Good But Makes Me Feel Like I’m Eight: I love pink more than the average Jane, but this dress and I have had our issues. I like how it fits and looks, but there’s that ruched elastic around the waist that reminds me of outfits I had as a child. Verdict? Get rid of it! So here’s what’s left. I’ve been considering adding a Versalette to the mix, which would probably eliminate at least one or two of these dresses, but for now I’m happy with my closet. Does it serve a unique purpose? Make sure it’s not redundant. I’ve been working on my “fear of wearing the same thing twice” and it’s actually nice to have fewer options that you know you look awesome in. No more last-minute shopping trips. Does it bring you joy? Does it make you feel like you can climb mountains? Then go for it, as long as it meets at least one of the other two criteria. Is it versatile? While this isn’t always a necessary trait, I find that it’s much easier to get by with a flexible wardrobe. There’s also nothing better than combining old clothes into an outfit that people think is new. What is your favorite dress or piece of clothing? 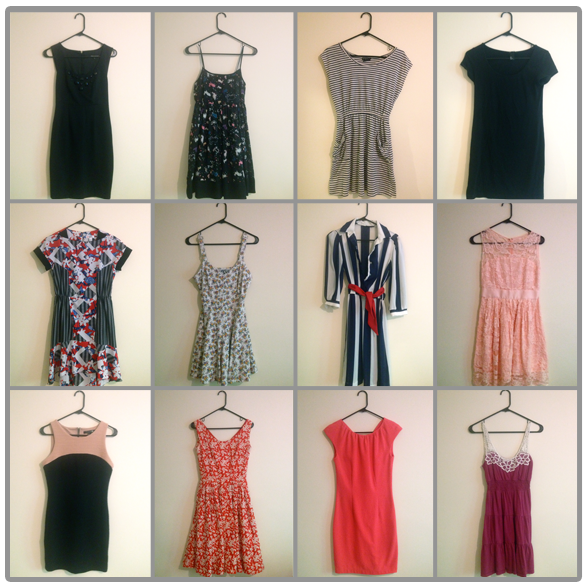 This entry was posted in Home and tagged clothes, declutter, downsize, dresses, wardrobe. Bookmark the permalink. That’s fantastic! I’ve never heard of a capsule wardrobe until now. I love the pieces you’ve picked – I hope the project goes well!